It looks like a typical recipe blog, coming with close-up photos of various foods. The layout is clean, the navigation is clear. The advertising is relatively more aggressive. This blog is on WordPress platform with custom design by Purr Design LLC. W3 Total Cache plugin is used for site performance optimization. The Copycat Recipes section make the most unique feature. A copycat recipe shows you how to have a homemade copy of a popular restaurant dish. With copycat recipes, you can make at home the P.F. Chang’s Chicken Lettuce Wraps, Cheesecake Factory's Louisiana Chicken Pasta, Panda Express' Kung Pao Chicken, and a lot more. With significant web traffic, this blog generates steady income from advertisements. There are Google Adsense and other ad banners allover places on the page, - on the header, sidebar, bottom, and blended in the middle with blog contents. The blog owner is savvy about ad placement and sponsorship. Currently they have partnerships with an herb company and a natural peanut butter brand. Snyder tries to limit deals to things she actually uses. 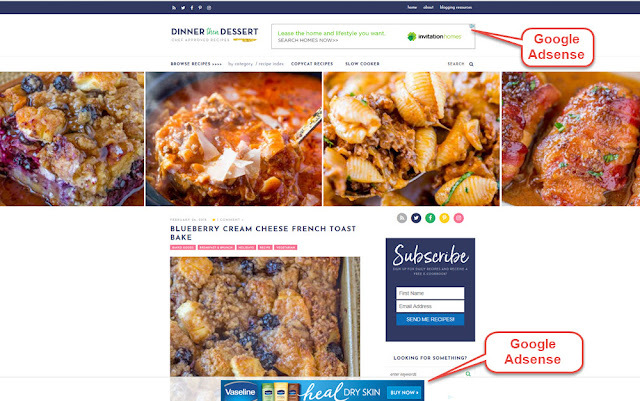 The Dinner Then Dessert blog does well on social media. Its Facebook has 335k likes, Twitter has 7000 followers, Pinterest has 44k followers, and Instagram has 25k followers.